ACCESS THE NEW SUSTAINABLE MOBILITY DATABASE HERE. Today, billions of dollars in private investments are backing on-demand and seamlessly connected transport options, smartphone apps for better decision-making, and new ways to collect and use traffic data. These “new mobility models,” headlined by companies like Uber, are not only fundamentally reimagining transport vehicles, their ownership and the delivery of mobility services, they are shifting the makeup of the transport industry. New mobility services have the potential to positively redefine urban mobility—if they can better meet the diverse needs of all residents. Such an outcome requires holistic governing frameworks that cover policies, financing and business development support, and integrate these innovations with traditional and informal transport modes in order to achieve sustainable goals and commitments. New mobility services pose both opportunities and challenges: they may reduce the number of single occupancy vehicles on the road and improve access to transport, but they can also reduce mass transit use, and increase congestion and pollution. Many governments are attempting to regulate these services to create a level playing field while keeping commuter interests in mind. To achieve desirable outcomes, it is critical for cities to send the right policy signals. 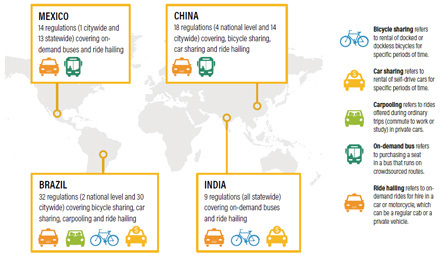 WRI Ross Center for Sustainable Cities has undertaken an exercise to track and map shared mobility regulations in Brazil, China, India and Mexico. This is the first database of its kind that focuses on how cities in the global south are reacting to these disruptions. The database identifies similarities across geographies and points out unique features that can inform cities and decision-makers on how their peers are regulating shared mobility services in a pursuit of better mobility for all. We are only beginning to understand the impact of new mobility services and further studies are key to assessing the implications of regulations and how they shape the mobility ecosystem. The database comprises national-, state- and city-level regulations that set standards for new mobility services or in some way influence how they operate locally. We mapped regulations from cities or states with more than 500,000 inhabitants. In China, 18 major city and national regulations are covered that influence an estimated 190 local regulations. For more information about the database, contact Jyot Chadha. WRI Ross Center is a founding member of a consortium of international research organizations, led by Zipcar Co-Founder Robin Chase, that has produced general guidelines for urban decision-makers and stakeholders to understand and harness new mobility trends. The 10 Shared Mobility Principles for Livable Cities – produced by Robin Chase, the C40 Climate Leadership Group, ICLEI – Local Governments for Sustainability, Institute for Transportation and Development Policy, Partnership on Sustainable Low Carbon Transport, Rocky Mountain Institute, Shared-Use Mobility Center, and WRI Ross Center for Sustainable Cities – encourage the best outcomes for all. How flows of people and vehicles are managed dictates quality of life and access to opportunity for billions of people. We want to ensure that ongoing developments in technology, operational systems, ownership and service business models lead to more livable, sustainable and just cities. For more information about the principles, consortium and how to participate, visit sharedmobilityprinciples.org.